Old North Bridge Hounds is carrying on a Groton tradition of many years ago: fox hunting in Groton. The old Groton Hunt kennel was at Surrenden Farm located next to The General Field. 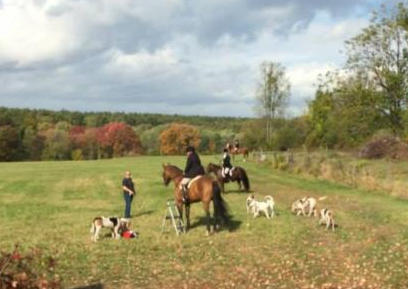 On Oct 10th at 10 AM hounds will meet at The General Field to follow a scent line of anise liquor through the trails of Groton, as a tribute to this long-ago sport. The scent is laid by people to make sure the hounds go where the “hunt” is planned. This is known as a mock fox hunt, since there is no fox in the mix. In days of old The Groton Hunt searched for wild fox. However, unlike England, the fox was not dug from its hole but allowed to escape to be chased again. On October 10th at 10 AM, an old time fox hunt will be re-enacted, with hounds, horses, costumes, but no fox! The hounds bay when they find the scent to call the other hounds to join them. 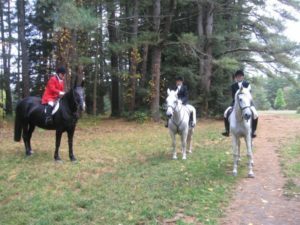 Horses with mounted riders dressed in formal hunting attire will follow the hounds. All can be seen from the General Field parking area. The huntsman may blow her horn to call any straying hound. So it is not only a sight to watch but to hear as well. The hunt ends at Groton Place where statues from the Groton Hunt era abound. Pictures courtesy of Old North Bridge Hounds and GCT trustee Wendy Good.